Mr Pym, who is the grandson of Violet and Evey Pym, of Foxwold, two of the Calderons’ closest friends, sent me this poem a fortnight before the anniversary of George Calderon’s death. He was not able to take part in the Commemoration itself at Hampstead on 4 June. Emmetts, the garden of which is now a National Trust property, was the home of Violet’s parents, Frederic and Catherine Lubbock, and is within walking distance of Foxwold. 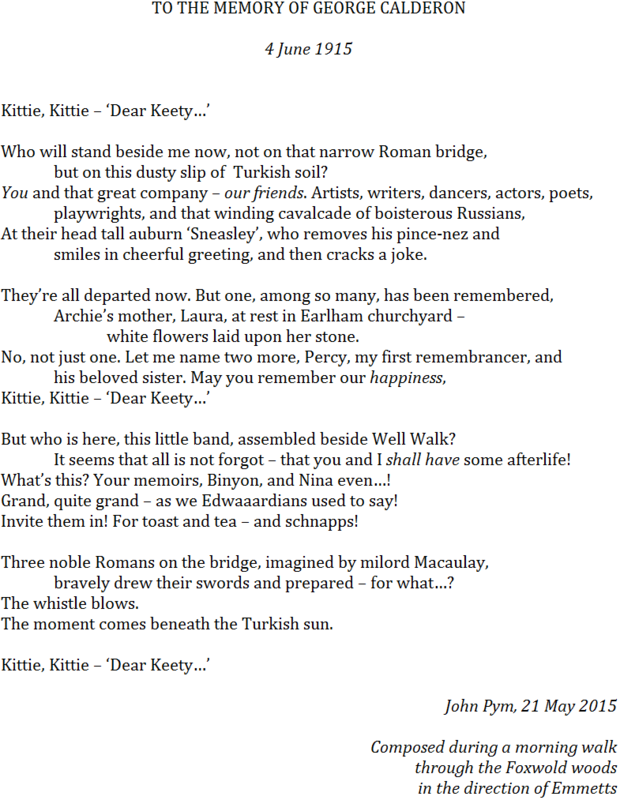 The poem is voiced for George, but the refrain may be taken to be in a dual voice: ‘Kittie, Kittie’ is George speaking, but ‘Dear Keety’ is the author quoting George’s ‘Russianised’ version used, for instance, in his letter of 10 May 1915 as he left Devonport for Gallipoli (‘Good night and goodbye, dear Keety; your loving old spouse P.’). ‘that narrow bridge’: see Macaulay’s poem How Horatius Kept the Bridge. George Calderon was a classical scholar. ‘Sneasley’: Anton Chekhov, whose surname is derived from the Russian for sneeze. ‘Archie’s mother, Laura’: Archie Ripley (1866-98) was Kittie Calderon’s first husband; his mother Laura Ripley (Gurney by her first marriage) was a grandmother of Percy Lubbock and is John Pym’s great-great-grandmother. Flowers were laid on the Ripley family grave at Earlham in an act of remembrance on 2 May 2015. ‘Percy, my first remembrancer’ is Percy Lubbock, author of George Calderon: A Sketch from Memory (1921); ‘his beloved sister’ is Violet Pym. ‘Edwaaardians’: an older generation pronounced the ‘ward’ syllable to rhyme with ‘card’. ‘The whistle blows’: to go over the top. This entry was posted in George Calderon, Personal Commentary, Timeline and tagged Anton Chekhov, Archie Ripley, Captain Charles Evelyn Pym, Catherine Lubbock, comments, Dardanelles, Devonport, Earlham, Emmetts, Foxwold, Frederic Lubbock, Gallipoli, George Calderon, Hampstead, Horatius, John Pym, King's Own Scottish Borderers, Kittie Calderon, Laura Ripley, Percy Lubbock, The Great War, Third Battle of Krithia, Thomas Babington Macaulay, Violet Pym, Well Walk, World War I. Bookmark the permalink.